Increasing public and commercial infrastructures, upcoming FIFA World Cup 2022, and changing rules & regulations are the few factors that have spurred the market for video surveillance in Qatar. Incapability of physical security to provide 24*7 vigilance has opened the gates for intelligent video surveillance security systems. The advantages of surveillance systems over the physical security such as ability to allow remote and continuous monitoring have resulted for their wide deployment across Qatar. Video surveillance market is mostly dominated by IP based surveillance systems which is further expected to get boost in the forecast period. IP based surveillance systems are finding their space across industry verticals, namely: government & transportation, banking & financial, retail & logistics, commercial offices, industrial & manufacturing, hospitality & healthcare and residential. According to 6Wresearch, Qatar's Video Surveillance Systems market is estimated to grow at a CAGR of 17.0% during 2015-21. In 2014, IP based surveillance systems have accounted for majority of the revenue share in the overall market. Government & transportation, commercial offices and retail & logistics verticals have captured key share in overall video surveillance market. The report thoroughly covers the video surveillance market by types, components, by applications, and regions. The report provides unbiased and detailed analysis of the on-going trends, opportunities/ high growth areas, market drivers, which would help the stakeholders to decide and align their market strategies according to the current and future market dynamics. •	Historical data of Qatar Video Surveillance Market for the Period 2010-2014. 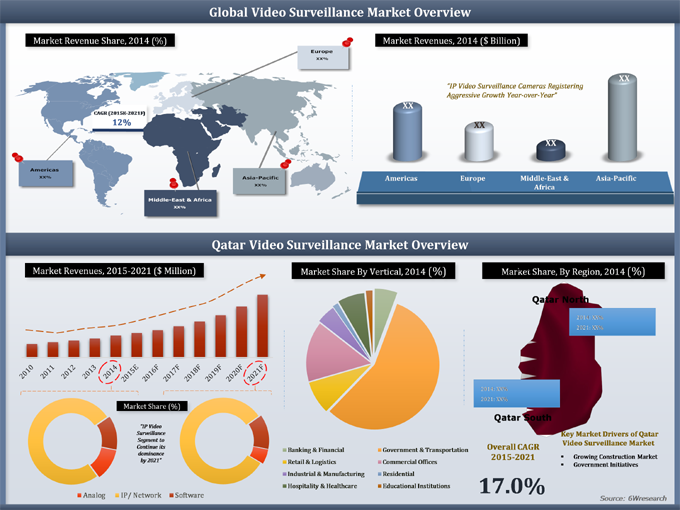 •	Market Size & Forecast of Qatar Video Surveillance Market until 2021. •	Historical data of Qatar Analog Video Surveillance Market for the Period 2010-2014. •	Market Size & Forecast of Qatar Analog Video Surveillance Market until 2021. •	Historical data of Qatar IP Video Surveillance Market for the Period 2010-2014. •	Market Size & Forecast of Qatar IP Video Surveillance Market until 2021. •	Historical data of Qatar Video Surveillance Application Market for the Period 2010-2014. •	Market Size & Forecast of Qatar Video Surveillance Application Market until 2021. •	Historical data of Qatar Video Surveillance Regional Market for the Period 2010-2014. •	Market Size & Forecast of Qatar Video Surveillance Regional Market until 2021. 13.3	Bosch Security Systems Inc.
Qatar is one of the fastest growing economies amongst GCC countries. On account of growing construction market along with intensifying security concerns, Qatar witnessed increase in deployment of various electronic security systems. In Qatar's video surveillance market, IP/ Network video surveillance systems segment is recording higher growth than analog video surveillance systems, owing to government regulation towards installing IP/Network surveillance cameras at retail, commercial offices, government & transportation applications, etc. Some of the major players in Qatar's video surveillance market include- Axis Communications, Bosch Security Systems, Honeywell, and Pelco by Schneider Electric.